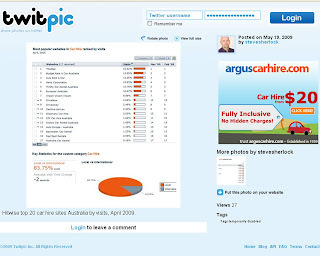 Saw a tweet this afternoon from top BOOT commentator and Oodles boss Steve Sherlock that for the second month running the car meta-search site has topped the Hitwise traffic ratings in the Car Hire category. Beating out budget, Avis, Hertz, Thirty and a host of local competitors. Big snaps for Steve and the team for the result. Their team has worked hard for this with a great product. Like any good Web 2.0 exec, Steve celebrated by posting a twitpic in his twitter feed. Only downside is that the twitpic ad alongside his celebratory photo was for arguscarhire, a competitor powered by CarTrawler. Photo below. Nonetheless great job by Oodles. As far as I know they are the only meta-search company that are number one in traffic in a category. Do you know of any others? admittedly a lot of our traffic comes from the hundreds of car hire depots around the country who use oodles to compare their rates with their competitors. we know the majority of yields managers also set their prices after checking first on our tab-matrix results screen. seems they like the side-by-side (apples with apples) comparison. Does put a bit of stress on our servers and effects our conversion rate but we're not complaining. in addition we have a growing affiliate network who all link back to the oodles site, and don’t convert nearly as well as direct and sem traffic.